Bougainvillea 'Marie Blanc' (Bougainvillea 'Marie blanc'): growing, planting, caring. 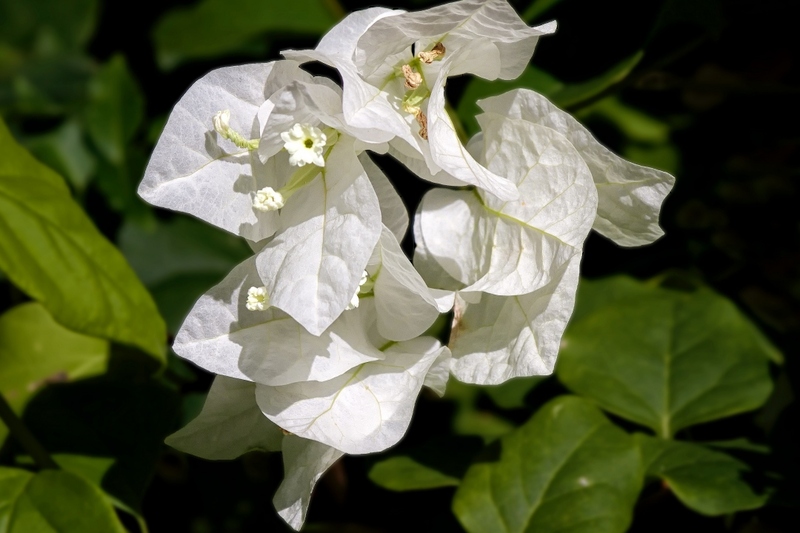 Full description for Bougainvillea 'Marie Blanc' not yet available. These are thorny climbing shrubs with bright colors that are not due to flowers. Flowers are small and white, and it is the bracts of the end of the twigs that surround them that offer various colors: pink, red, orange, yellow, white. In open soil or in pot? It's simple, if at home the temperature drops permanently below 5 ° C, it will be in pot! It is easily found in shops in the spring, in pots often of already substantial size. Do not leave your ophiopogon in the original pot, but repot it in a slightly larger pot - terracotta! Plant in the spring in a sheltered and sunny place. The ophiopogon calls for a rich and well-drained soil because it dreads when its roots stagnate in the water. In the open soil, choose a slightly sunny location, even in the semi shade. Water copiously to facilitate rooting. Bougainvillea supports very well dryness when it is well rooted. Besides, the less it is watered, the more it blooms! For a balanced plant, help by watering during growing season. In pots, water when the susbtrate become dry, and during winter, indoors, watering once a month should suffice. In open soil, waterings should be moderate, except in case of intense drought. Pruning the bougainvillea is not really essential, it is even discouraged when it is too severe! The flowers appear on the wood of the previous year and a trimming would therefore remove the chances of flowering! However, you may need to balance the branches to prevent your shrub from becoming asymetrical. Avoid in this case to cut all the bougainvillea, but proceed slowly, season after season. Prune imperatively at the end of winter, after any risk of frost. Your bougainvillea is non-hardy - it will not survive a frost episode! If your plant is outside and you dread a very cold period, mulch your foot and protect your plant with a veil for wintering. If your plant is in a pot and you have a sheltered place with a minimum temperature of 10 ° C, sufficiently bright, bring it inside for wintering, before the first frosts. Water very little during the winter. You can take it out again in May. Well after the last frosts, get out, if you can, your bougainvillea in pot and put it in a sheltered, sunny place! You can add, if necessary, before and during flowering, a liquid fertilizer to stimulate flowering. Wood ashes can also just do the trick! In any case reduce the amount of fertilizer at the end of the summer and stop completely in early autumn. Indoors, especially if it stays there all year, the bougainvillea needs regular fogging of the foliage with non-calcareous water to sustain the humidity it needs. If the leaves turn brown and eventually curl, it is certainly an attack of aphids. If the leaves turn yellow rather suddenly, it is certainly an attack of mealybugs: in both cases, a spraying of water added with baking soda and a little soap can get rid of it. Repot at least every 3 years, to adapt the container if necessary, and to change the substrate. Renew it as much as possible, bringing soil and sand for a good drainage.